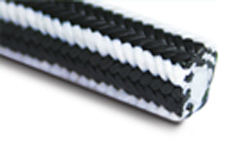 Graphite-PTFE fiber yarns and lubricated PTFE yarns are braided to a packing in combination. It shows excellent chemical resistance, mechanic strength and self-lubricating. Suitable for corrosive fluid, organic solvents, chemicals rotary machine, rotary pumps, reciprocating pumps, agitator, etc.